Checked out of the Travelodge and drive away from the cloudy sky over Page towards Big Water. We try Smoky Mountain road again and today get through the riverbed and on for some more miles before the mud gets to heavy and we have to turn around.We continue HWY 89 west even further away from the clouds and turn into Cottonwood road. There is a sign just after the pavement ends saying: “High clearance 4 wheel drive vehicles recommended” – no problem with the Jeep, off we go! Soon we come across the first big mudhole, and then another one and another one and the next one is just too deep and wet to get through. We see trails of other cars turning around and no traces going through. So we turn around, park the car and go for a walk. We don’t have to go very far to end up on a hill from which we have a teriffic view over some very specificly colored rock formation typical for this area. Back at the car we try another dirt road. 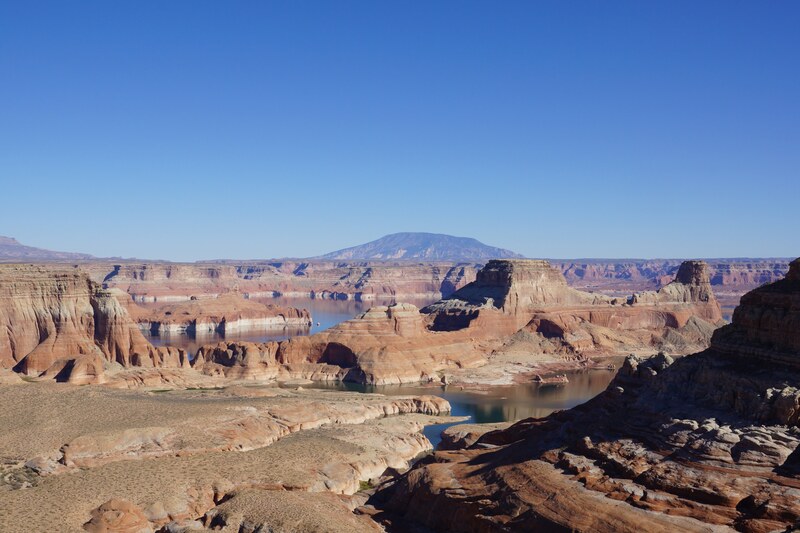 We stop at the view point and from there climb down through the clay into a canyon with beautiful “Hoodoos” (soft stone at the bottom and a hard plateau on top) we admire rocks in all colors from white, through green to purple every color is present. Meanwhile the sun has dried the mud to a certain degree but there still are some very critical creeks and at some of them my heart stopped beating until we were safe on the other side. But, even here we get to one which is the last one for our Jeep. But, Marco brings us back safely. In the afternoon we check in at Debbie’s Hide A Way again, we go shopping and then turn on the BBQ, in the backyard of the Motel. A delicious Ribeye steak with a cucumber, cherry tomatoe and olive salad – we haven’t eaten that well in weeks! After 6:00 pm we head out again with the camera to take some pictures of the sunset over Lake Powell – magnificient as expected!